Commercial floor scrubbers are widely used all over the world. The technology has advanced to manufacture autonomous floor scrubbers, which had generated a market size of USD 1,450 million in 2016. The improving technology of the floor scrubbers and the growing automation in the end-use industries is driving the growth of the market. There is a continuous increase in the hotel industry and thus the increasing demand for floor scrubbers. The hospitals are regarded as the quick adapters of advanced technologies; therefore, advanced floor scrubbers have huge application opportunities in hospitals. Further, sit-on scrubbers are in trend at the commercial places on the back of comfortable and convenient floor cleaning experience of the users. Multiple new companies are entering the market with the majority of them offering autonomous floor scrubbers. Goldstein Research analyst forecast that the global commercial floor scrubbers market is set to harness market revenue of USD 14.6 billion by 2025 growing at a CAGR of 8.40% over the forecast period (2017-2025). Walk-behind floor cleaning scrubbers segment accounted for the largest market share of 48.7% in 2017 followed by sit-on scrubbers and autonomous scrubbers. Over the forecast period, sit-on scrubbers are expected to dominate the market closely followed by robotic scrubbers. Based on geography, North America region accounted for the largest revenue share of 39.3% in 2017 of the global commercial floor scrubbers market on the back of a large number of commercial spaces and their huge developmental activities in the region which attracts the adoption of floor scrubbers. Further, APAC industrial floor scrubbers market is expected to grow at a CAGR of 9.1% over the forecast period. The report covers the present ground scenario and the future growth prospects of the commercial floor scrubbers market for 2017-2025 along with the market players’ analysis. We calculated the market size and revenue share on the basis of revenue generated from major players in the Global region. Global Commercial Floor Scrubbers Market Report 2017-2025 has been prepared based on an in-depth market analysis from industry experts. The report covers the competitive landscape and current position of major players in the Global commercial floor scrubbers market space. The report also includes Porter's five force model, SWOT analysis, company profiling, business strategies of market players and their business models. “Global Commercial Floor Scrubbers Market Research” also recognizes value chain analysis to understand the cost differentiation, pricing models to provide a competitive advantage to the existing and new entry players. 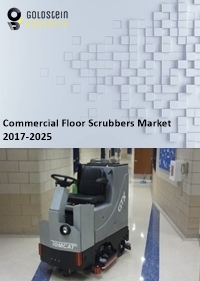 Our Global commercial floor scrubbers market report comprises of the following companies as the key players: Nilfisk, Tennant, Koninklijke Philips N.V., Brain Corporation, Hako, Bortek, Comac, Tornado, Fimap, IPC Gansow, Karcher, Wiese, etc. The study was conducted using an objective combination of primary and secondary information including inputs from key participants in the consumer & retail market. The report contains a comprehensive market and vendor landscape in addition to a SWOT analysis of the key vendors. What is the total market size by 2025 and what would be the expected growth rate of the market? What are the market opportunities for the existing and entry-level players?